Dr. Heather Barron received training in wildlife medicine and surgery through vet school and a residency at the University of Georgia, College of Veterinary Medicine, where she later became a tenured Associate Professor in the Zoological Medicine Service. After a decade at UGA, Dr. Barron obtained further international experience as Department Head of Clinical Medicine at St. Matthew's University, School of Veterinary Medicine in the Cayman Islands, where she was also the veterinarian for the Cayman Turtle Farm and Cayman Wildlife Rescue. She has served as a consultant for both IDEXX and Antech Imaging Services and is a former president of the Association of Avian Veterinarians. 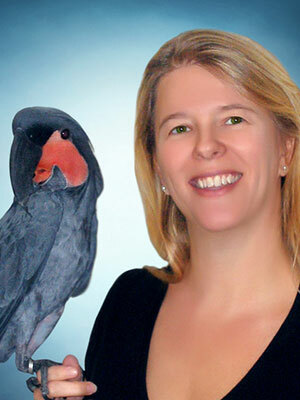 She has lectured and published extensively in the field of wildlife and exotic animal medicine. She is a board certified avian specialist and a licensed wildlife and sea turtle rehabilitator with over 20 years of experience in practicing and teaching avian and wildlife medicine. She lives on sunny Sanibel Island, FL with her husband and 3 young children. This lecture will focus on decreasing stress in wildlife or exotic animal patients through the use of anxiolytic and psychotropic drugs, improved husbandry techniques, welfare-oriented handling, and staff education. Integrative and practical approaches to minimizing anxiety in special species in hospital or captive settings will be emphasized. Real case examples will be used to highlight simplistic approaches to improving welfare in wildlife patients in even the busiest private practices.